The closest you'll get to a 2D Resident Evil. Well, except for Gaiden on Game Boy Color, but no one wants to play that. 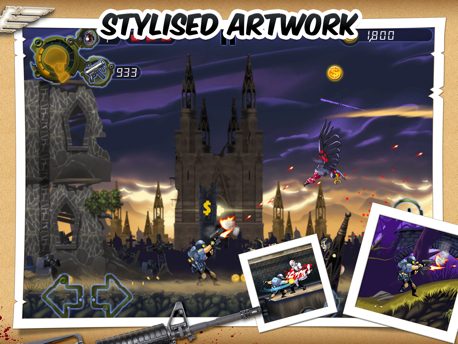 When it comes to iPhone and iPad, 2D graphics don't get much better than Apocalypse Max: Better Dead Than Undead, a side-scrolling zombie shooter from Wandake Studios. Believe it or not, this game is on par visually with titles from Xbox Live Arcade and PlayStation Network, with a variety of unique environments dripping with detail, a noticeable lack of jaggies and some of the coolest death animations we've seen, with monsters getting cut in half and their guts spilling across the ground. Suffice to say, it's a game you'll enthusiastically want to show off to your friends. Oh yeah, and you can shoot zombies and stuff. 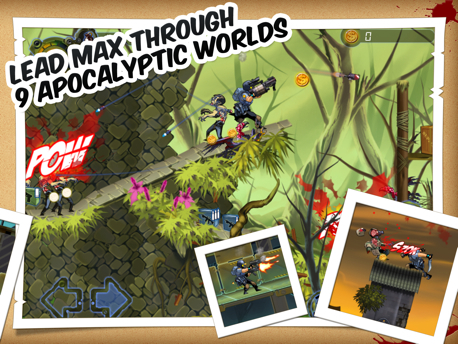 Quite frankly, Apocalypse Max reminds us of a 2D Resident Evil, as Max blasts his way through a forest, swamp and other locations teeming with undead and a welcome number of crates that hold goodies like grenades, much-needed health packs and ammo. You'll also want to pick up as many gold coins as possible, since the game has a store filled with upgradeable weapons, including a shotgun, grenade launcher and, in a cool surprise, the pulse rifle from the iconic movie Aliens; first weapon we purchased, despite having to pay 10,000 coins. Or you can just go with the standard issue pistol, though we don't recommend it for the messier jobs. On that note, the game includes 16 different zombie types, all of which do a great job making Max dead. Standard issue walkers are easy enough to kill, but the explosive egg-dropping vultures, cleaver-throwing zombies and bothersome zombie piranhas (as if those flesh-eating fish couldn't get any worse) make his virtual life extremely difficult, especially since they have a tendency to attack in numbers. Fortunately, Max comes equipped not just with guns, but also a handy melee attack that cuts those enemies literally down to size; use this knife attack to break boxes. A little confusion crops up when using it, since you need to swipe in opposite directions depending on whether Max faces left or right, but you'll get the hang of things. What's more, an auto-targeting system frees you from struggling with manual aiming, though once and a while, we'll yearn for it, particularly when trying to hit those aforementioned birds. Finally, jumping into the air and swiping instructs Max to bring the knife down upon their heads, a useful maneuver, indeed. That said, two things bug us, starting with the tiny jump button. An option to enlarge it would be much appreciated. We also have trouble wrapping our heads around Max's health. Just can't determine how much is left, since he can absorb damage with no medkits. These, however, are small issues compared to the overwhelming number of positives. Apocalypse Max doesn't break new ground in the 2D platform/shooting genre, but its high-level of polish puts it right up there with the best iOS has to offer. 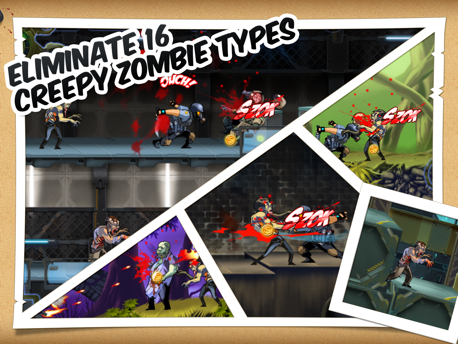 You can't call yourself a zombie fan without downloading this entertaining game. Review code provided by Wandake Studios. What's Hot: Twenty levels of zombie-shooting bliss, 20 different weapons and ammo to play with, top notch 2D visuals and animation, auto-targeting, includes the pulse rifle from Aliens. What's Not: Jump button is too small, health system a bit confusing.